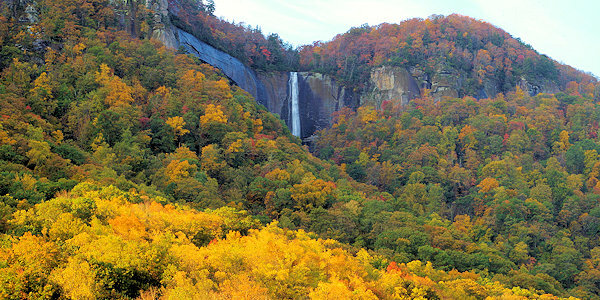 The 404-ft. tall Hickory Nut Falls at Chimney Rock State Park is one of the highest waterfalls east of the Mississippi. Take a beautiful woodland hike on an easy 3/4-mile trail to enjoy an up-close view at its base from a platform. While there is no swimming or wading in the cool water, there's a picnic table to enjoy a snack or meal with a view. 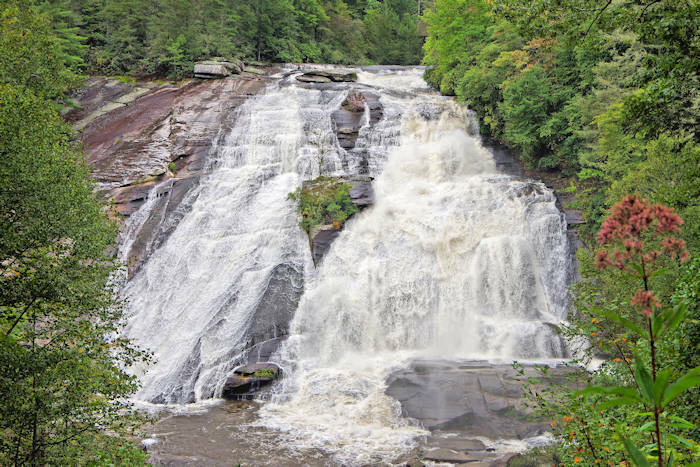 The waterfall is most famous for being featured in the 1992 film The Last of the Mohicans, with the final fight scene at the brink of the falls. The water flow varies depending on recent rainfall. During dry periods, the flow reduces to a small stream; while after a heavy rain, the flow is very impressive. You can also get a glimpse of Hickory Nut Falls high on the rock cliff from the valley in the village of Chimney Rock (pic above). 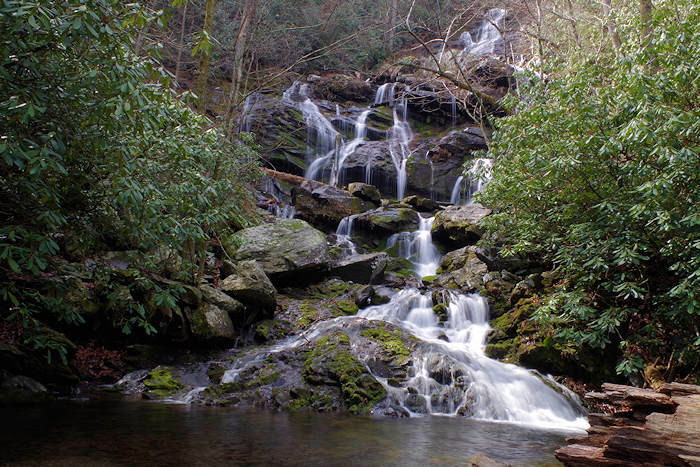 The 1.5-mile round-trip hike is a beautiful walk through hardwood forests by rock cliffs. In spring, the Carolina Rhododendron puts on quite a show. See rare and endangered wildflowers, as well as old favorites like Jack-in-the-pulpit and Solomon's seal. Leashed pets are welcome. This trail starts from the lower end of the main parking area below the Chimney. The trail also connects with other trails in the Park, including the Four Seasons Trail that heads down the mountain and the Outcroppings Trail that climbs to the top of the Chimney. 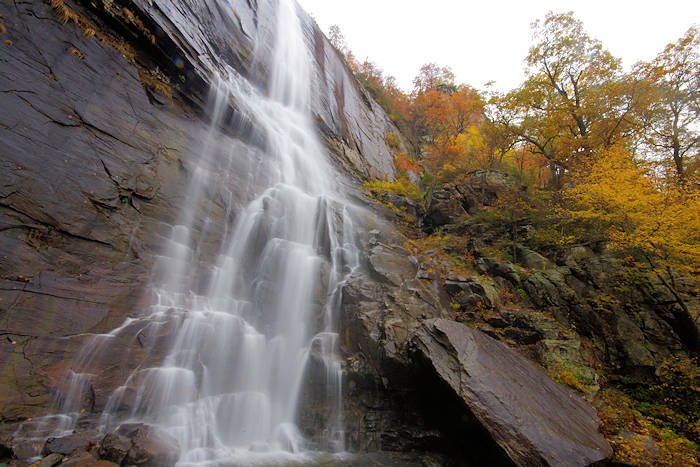 You must purchase a ticket to Chimney Rock at Chimney Rock State Park to hike to the waterfall. 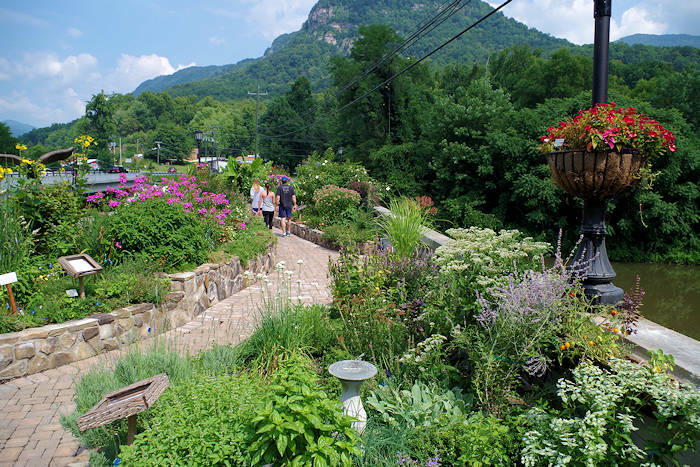 See our Chimney Rock Guide to plan a visit! 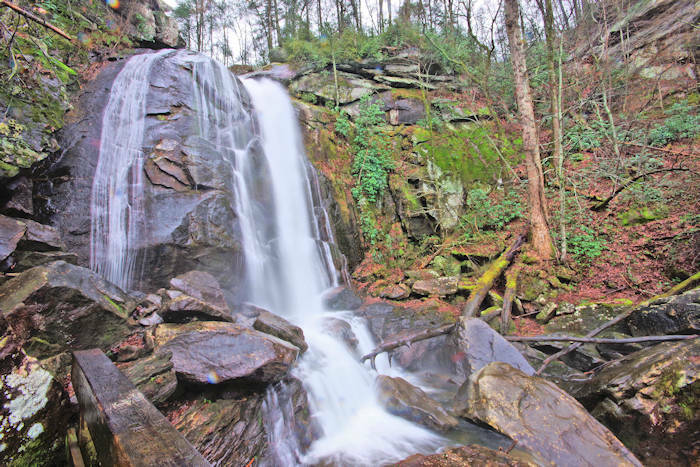 Read about other nearby waterfalls and other things to do in Rutherford County. 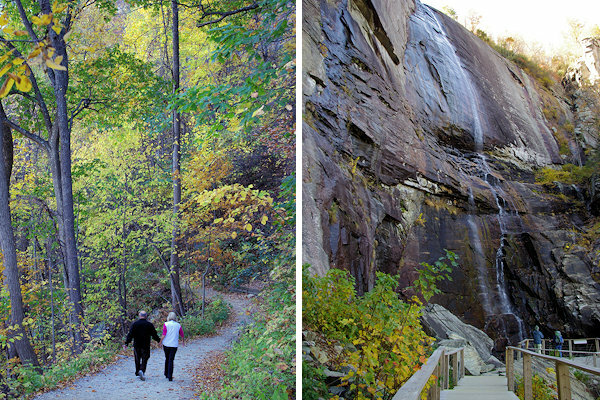 For another hike at Chimney Rock, take the Skyline Trail to the top of Hickory Nut Falls.